I went to the Om Yoga Show and all I got was this t-shirt. Lies! Hell will freeze over before I go anywhere near a vegan-friendly yoga exhibition without spending all my pocket money on all the goodies. My sister and I used to attend the now defunct Vitality Show at London’s Olympia. I have fond memories of systematically snaking up every aisle Pacman-style, ensuring we didn’t miss an opportunity to grab a freebie. We like freebies. And shopping. That’s how we earned our moniker The Shopping Sisters. The Om Yoga Show is held at Alexandra Palace, which is even bigger than Olympia. There was room for demonstrations, classes and workshops as well as hundreds of stands selling everything from mats and straps to vegan chocolate, protein balls and shampoo. Paradise in a palace, if your paradise is yoga and veganism, as it is for moi. Sister has moved to Burma, which means this Shopping Sister is without her wing-man. I attended the Om Yoga Show with my yoga teacher, my yogini, Ami. We’ve practised a lot of yoga together, but how would we fare branching out into yoga shopping? Would she be as systematic as I? Would she care for visiting every single stand, trying every sample and swiping every freebie? Course she bloody would. Turns out my yogini is as much of a legend off the yoga mat as she is on it. She humoured my shopping style and allowed me to Pacman my way around the arena. Banana and Coconut especially tasty. We met Adam! The actual man whose actual name is on the actual packaging! He was lovely. If vegan chocolate can taste this good, why are they still bothering with dairy milk over at Other Brands? I don’t get it. Close up for extra salivation and titilation. We also discovered the mighty fine Coco Caravan chocolate. Date Caramel was scrumptious and extra points for suave packaging design. Plus, I love caravans. Coco Caravan - making caravans posh. There’s always a great discount at these events and I think it was three-for-two on The Coconut Merchant stand, although I can’t really remember because I was delirious on free samples by this point. I bought two coconut ‘honey’ alternatives. One for me, one for my brother, who loves honey in his tea. I’m trying to lure him into the vegan way, one product at a time. I don’t really use coconut oil for much in life. Just cooking. And slathering on my hair for an overnight shine booster. And on my face as a deep moisturiser that’s troubled-skin friendly. And on my legs after I’ve shaved. And on my hair again, before I swim, to act as a protective barrier from chlorine. Sometimes when I’m cooking I just go oh whoops it’s all over my hands and then I slather it up my arms and get on with the stir-fry. So, it’s just one of those products that sits in the cupboard not knowing what to do with itself, you know? Vegan food is so dull, they say. Ha Ha Ha! I say. While feasting. My utilitarian husband has never understood why I chop and change hair products. He wants one bottle, one brand, for life. I find inexpressible joy in reaching the end of one bottle, so I can move on to the next. I’m on a mission to try all the shampoos. Now I’m vegan, I'm discovering previously unknown brands and seeing what small wonders they can do for my locks. I now lather smug in the knowledge no animals have been harmed in the making of my good hair days. Alba Botanica smells like tropical meadows, if you get meadows in tropical climates. The three-for-two show day deal was out in full force so I 'won' the coconut milk leave-in conditioning mist, which is a treat when my hair is a tangled mess. These mango and honeydew delights are so lovely that they have reached that rare pinnacle of haircare products within danger of being used by my husband - I have labelled them. Sensuous shampoo should not be wasted on the balls of a man who complains about my conveyor belt of bubbly discoveries. I label my best bottles with info-signs such as 'For my hair, not your balls'. That definitely keeps him away from my stuff, right? And makes me a really fun housemate. Everyone’s a winner. The papaya enzyme facial mask has a lovely cooling texture and doesn’t dry on so my face doesn’t end up feeling like a cracked old cake left in the oven. The jasmine moisture cream is soft and works well as a makeup primer. The aloe and green tea moisturiser is a great night cream. Yogi was my favourite tea brand before I even liked yoga. What a coincidence! Mug compliments of The Vegan Kind. They give good. Look! Freebies! Ok, the ticket was a tenner and there was fuel to get to and from London, but FREE TEABAGS! Yogis can prepay to join exclusive yoga classes with the likes of Goldie (yes really) or Marcus Veda but there were lots of free classes throughout the day for freestylers. These were massively over-subscribed so unless you’d been queuing for half an hour, you weren’t getting in. We missed out on aerial yoga, but we did get into Dru Yoga and Yoga Jellies, both of which were fun. We had our picture taken by a yoga photographer - here we are doing Vriksasana pose. My tree is taller than Ami’s tree, but we did a good job of not uprooting while we were papped. Alexandra Palace is so huge they can put all the alternative therapies in another wing, which is good because you can either head straight there or avoid it altogether depending where your heart lies. We walked around the Room of Questionable Beliefs. Tarot cards, palm readers, psychics and distance healers abounded. I’m glad Alexandra built a palace big enough to give these guys their own area. 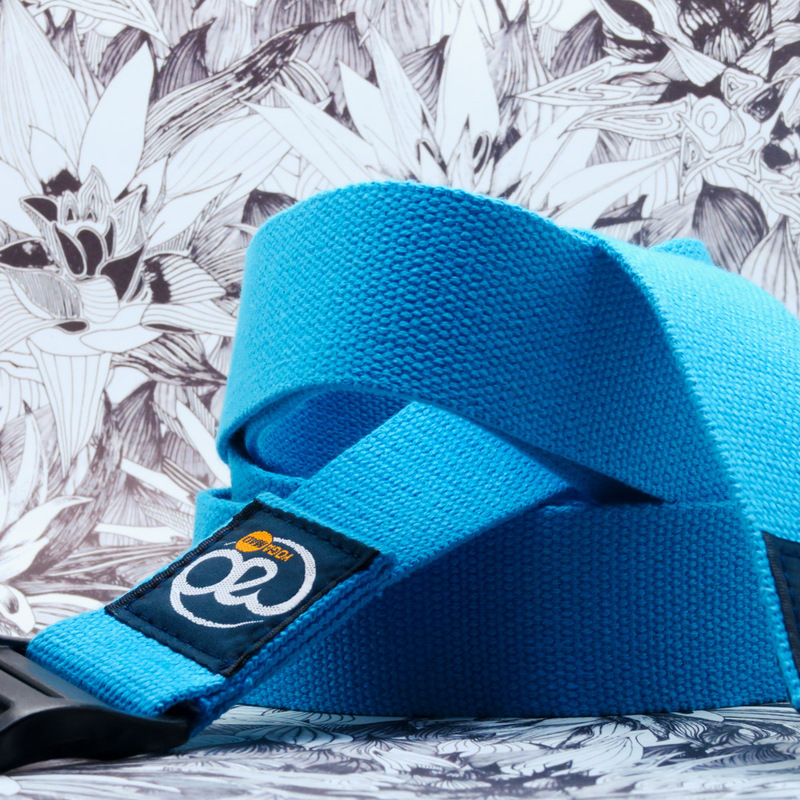 I didn’t need another yoga strap. But, now I've got one. A subscriber’s haul! Freebies with my new Vegan Life magazine subscription. I started yoga to help with my back troubles. I had no idea it would gift me a lifestyle, new experiences and adventures, new friends and new bends. Plus, the yogic principle of ahimsa 'do no harm' ties in nicely with veganism. To live one’s life without causing harm - ain’t that just a lovely concept?